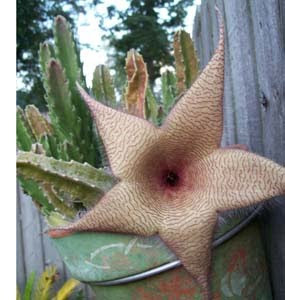 When opening the studio blinds this morning saw the Stapelia was blooming. I had heard on the news that we were supposed to have torrential rains today (on the far edge of Hurricane Ana), so I slipped out to get a picture ... in case the rains destroyed the bloom. This is the first this year and it is splendid.